Boeing and NASA revised the final assembly strategy for the Space Launch System core stage ahead of the uncrewed lunar test flight called Exploration Mission-1, NASASpaceflight reported Monday. The team aims to connect the stage horizontally in May at NASA's Michoud Assembly Facility in New Orleans before transferring it directly to the Kennedy Space Center in Florida by the end of the year. Craig Williams, team director for Boeing’s core stage integrated product division, said the horizontal approach is intended to expedite the SLS assembly process. 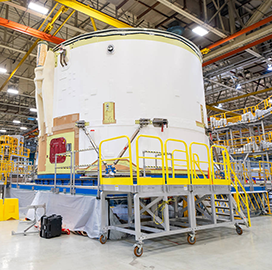 Both parties have worked to fully connect the SLS boattail assembly and engine section over the past month, leaving the rocket’s two other pieces slated for installation and further outfitting. The company expects to begin integration of hardware with the launch system’s liquid hydrogen tank by July.